There is no doubt that Donald Trump is the most corrupt president in the history of the United States. Instead of divesting himself from his business interests (as other presidents have done), he is making millions from being president by funneling taxpayer dollars to those businesses and from others seeking his pleasure by spending at those businesses. It's not just corruption -- it's corruption on steroids! President Donald Trump’s U.S. businesses have received at least $15.1 million in revenue from political groups and federal agencies since 2015, according to a new report to be released Monday. 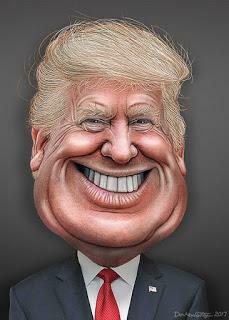 The money went to Trump’s airplanes, hotels, golf courses, even a bottled water company during the presidential campaign and the first 15 months of his presidency, according to a compilation of known records of the spending by Public Citizen obtained by McClatchy. But it was Trump’s campaign itself that spent the biggest chunk by far – about 90 percent, or $13.4 million. It also includes more than $717,000 from the Republican National Committee; nearly $595,000 from Trump Victory, the joint fundraising committee set up by the RNC and Trump’s campaign; and $9,000 from the National Republican Senate Committee Two political action committees, America First Action, dedicated to electing federal candidates who support Trump’s agenda, spent $33,000 and Great America Committee, Vice President Mike Pence’s group, spent $24,000. Campaigns and committees supporting Republicans House members Bill Shuster of Pennsylvania, Jodey Arrington of Texas, Tom MacArthur of New Jersey and Dana Rohrabacher of California also spent money on Trump businesses. By comparison, in 2013 and 2014, political spending at his properties was less than $20,000. . . . Since his inauguration, Trump has visited one of his properties, usually in Florida, New Jersey and Virginia on 138 days, according to a compilation of information released by the White House. Those visits have led to government spending. Federal agencies that spent money include the National Security Council, Secret Service, Defense Department, General Services Administration and U.S. embassies. Recipients include Trump Tower Commercial LLC, Trump International Hotel in Washington, Mar-a-Lago club in West Palm Beach, Florida, Trump National Doral Miami, Trump International Hotel Las Vegas, Trump Restaurants LLC, the Trump Corporation, Trump Payroll Corp. and Trump Plaza LLC.